When I look out my living room window, this is what I see. Maybe soon it will be the Comcast Building. It's a really really expensive piece of real estate. This is where NBC makes all their TV shows -- or a lot of them. They have studios, and offices, and carpeting, and cafeterias and water coolers and lighting and all kinds of staffing and support and security and God only knows what else. It was built in the 1930s, when the world was a very different place. There was no Internet. There was no digital. There were buildings. And offices. And studios. The building represents an enormous cost. Today, I think, buildings like these, and all that go along with them, are no longer necessary. Not only are the unnecessary, but they make 'media making' too expensive to support. 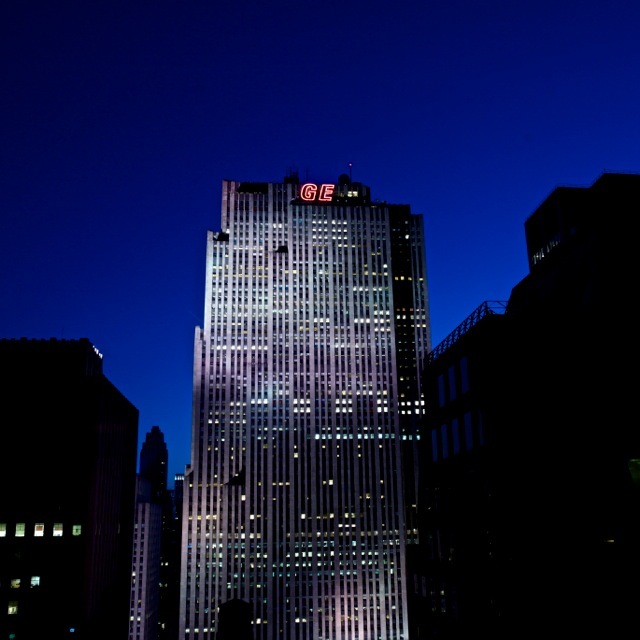 The New York Times also owns a big building, just a few blocks away from 30 Rock. They built it in 2007 at a cost of $850 million. This is, ironically, just slightly less than the entire valuation of the New York Times Company. And where is the Instagram Building? Apparently it is in the old offices of Twitter, in San Francisco. They have nine employees. That would not take up a lot of space in the New York Times Building or in 30 Rock. Craigslist, by the way, the company that broke the back of most newspapers, now has 70 employees and just left their Victorian house to lease a 14,000-sq-foot office in San Francisco. That would probably be a small portion of one floor of 30 Rock. Craigslist, by the way, has avaluation of $2 billion, or twice that of the New York Times. What is killing these businesses? I think, in part, it's the buildings. The whole notion of going to an office, sitting at a desk, doing your work there, and then coming home, is a remnant of an earlier era -- like when Rockefeller Center was built. Offices were necessary because that was where 'the business' was. That was where the secretaries were. That was where the typewriters were. That was where the telephones were. That was where the conference rooms were. The cost of the buildings, and all that come along with them is what is killing a lot of businesses -- particularly media companies. The buildings are unnecessary. So in fact, are most of the things that come along with the buildings -- like middle management (or upper management for that matter), along with the carpeting, flourescent lights and water coolers. Aasmah Mir used to drive to the office every day. Her office was at The BBC. She was an 11-year BBC journalist and presenter. It's her personal passion. And it's a media company (and a kind of DIY Food Network). She doesn't need a studio, she doesn't need a building, she doesn't need the BBC. Andrew Sullivan, long-time journalist and blogger just announced that he is taking The Dish private. For the first time in human history, a writer -- or group of writers and editors -- can instantly reach readers -- even hundreds of thousands of readers across the planet -- with no intermediary at all. He doesn't need a building. Or a parent company for that matter. This is what the technology now allows. Maybe Matt Lauer, Al Roker and Savannah Guthrie should all get together and set up their own production company out of Matt's house. As for 30 Rock, you could turn it into condos. Like they're going to do with the Sony Building on Madison Avenue, just up the street.